Aeroplastics is delighted to present, for the first time in Belgium, a solo show of the artist duo Florentine & Alexandre Lamarche-Ovize. The exhibition initiates the gallery's 2018 spring season and the title, Hyacinthe, refers exactly to the first blooming flower of this season. Lamarche-Ovize's work is characterized by an insatiable and encyclopaedic quest of discovery of botany, gardens, and everyday elements that become nature. The artists delve into an extensive research, exploring scientific books, the 'Arts and Crafts' movement, which is intrinsically associated with the process, craft, and skill of drawing. Before materializing an artwork, each annotation and project can be found in the artists' notebooks and graphic journals. The main piece of this exhibition is the site-specific mural created especially for the occasion. In front of the mural there is a single sculptural ceramic work. This is the artists' playful offer to the viewer - the vase and the flower as a gift. This complete artwork not only combines the different aesthetics, media, and craft of the artist duo, but also reflects one of the most prominent ideas of Lamarche-Ovize's work - Time. This idea can be here understood in different aspects - the time of the day, which in its different lights has conducted the conception of the drawing and its botanical and graphical components. The light and garden scenery are transported inside the gallery through the large glass windows in front of the work. Again, time - its passage and duration - is a characteristic of skill and craft so much evoked by Lamarche-Ovize and their appreciation for William Morris and the 'Arts and Crafts' movement, as well as for the publications of Elisée Reclus, a French geographer and anarchist. Thus, for the artist duo, time brings in itself history as reference - a cultural and scientific encyclopaedic compilation. Varengeville is a drawing made during a surprising discovery of a rare example of an 'Arts and Crafts' house and garden called Le Bois des Moutiers, in Normandy. 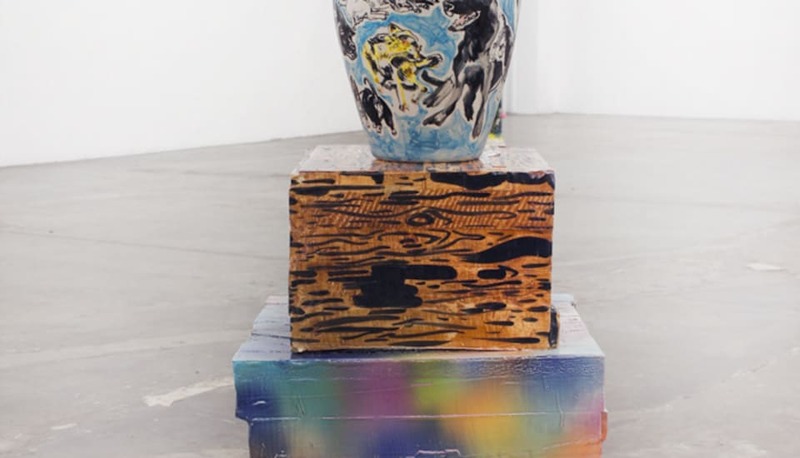 Throughout the gallery there are different series of sculptural ceramic artworks, some of them made during a residency at Luis Adelantado, in Mexico City. The artists were strongly influenced and open to the context of the city. This is visible in works that depict exotic plants, artichokes, and the city's stray dogs (which became a funny and perhaps critical interpretation of European kitsch porcelain dogs). Lamarche-Ovize also assume their role as tourists, which can be identified in Pop column (tourista), a sculpture depicting Florentine Lamarche on top of a pineapple sunset column. The series To Sarah consists in a group of reused silkscreen works. On top of the botanical black and white drawings, the artists include collages of pop culture elements - donuts, comics, cigarette butts. Additionally, in each work, the viewer will find historical and contemporary figures, one male and one female - pop stars, singers, authors, artists - as well as a newspaper page from the day the work was finished. As we reflect on Lamarche-Ovize's artworks, there is a harmonious coexistence of a duo and dualities: the intersection of the artists' media and unique language in a blissful union; the historical and encyclopaedic versus the ephemeral, disregarded, and popular contemporary elements; the time of the craft, the planning, and the thought that precede and permeate the execution of series of works (or staging of a show), merging with the unexpected events of a travel, a find or just the passage of a specific moment in time, just as the blooming of a Hyacinthe.